Two noteworthy Android tablets -- both in the 8-in. range, both $400. So which should you get? You'd think picking out a tablet would be an easy decision. When it comes down to it, they're all just rectangular slabs with screens -- right? Not exactly. Well, okay -- maybe technically. But as anyone who's ever shopped for a tablet can tell you, there's a heck of a lot more to it than that. 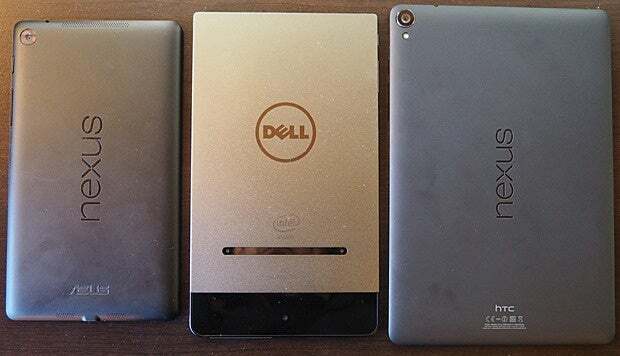 The latest two tablets competing for attention here in AndroidLand are the Nexus 9, Google's flagship slate for the Android 5.0 Lollipop platform, and the Dell Venue 8 7000, an eye-catching new contender with some unusually compelling qualities. After spending a fair amount of time living with both devices, let me tell you: They may be two rectangular slabs with screens -- and they may share the same price, at $400 -- but man, oh man, are they drastically different in terms of what they're like to use. The Nexus 9 has an 8.9-in. screen while the Venue 8 7000 boasts an 8.4-in. display. On paper, those numbers look pretty close -- but in reality, the digits don't tell the whole story. First of all, remember that screen size measurements actually represent the diagonal of a display -- so half an inch difference there means more than you might think in total area. The Nexus 9's display is nearly an inch wider than the Venue 8's, which makes it feel considerably more spacious when it comes to screen real estate. On the flip side, the Nexus 9 itself is quite a bit bigger than the Venue 8 (6.1 x 9.0 in. compared to 4.9 x 8.5 in.). For perspective, the Venue 8 is closer in size to the Nexus 7 than it is to the Nexus 9. That's not only because of its screen but also because of its design, which uses barely-there bezels to keep the footprint insanely compact. More screen space or single-handed holding and greater portability? Mull it over, and let's move on. The Nexus 9 is a warm and comfy device, with rounded edges and a soft-touch plastic back. But it's not what you'd describe as a premium tablet. That's a sharp contrast to the Venue 8 7000, which has a more angled metal-based body and high-end vibe. The Venue's nearly bezel-free design (on three out of four sides) gives it a striking and distinctive appearance. The tablet also feels more sturdy and well-assembled in general, without any of the creaky surfaces or mushy-feeling buttons a lot of folks (myself included) have experienced on Nexus 9 units. This is a big one: The Nexus 9 runs a pure and unmodified version of Google's spankin' new Android 5.0 Lollipop operating system. Plus, as a Nexus device, it's guaranteed to get future OS updates fast and frequently from Google itself. The Venue 8 7000, meanwhile, ships with a lightly modified version of last year's Android 4.4 KitKat software and will depend on Dell for future upgrades. Now, I'd normally be the first one to slap a manufacturer's wrists for launching a device with a dated OS nearly three months after a new version was released. But you know what? In this instance, I'm not ready to write it off as such a black-and-white bad thing. The reason, as I explained in my Venue 8 review, is that Lollipop still has some frustrating quirks and glitches. It has a lot of good things going for it, too, mind you -- not least of all its fresh and modern user interface -- but quite honestly, using it on the Nexus 9 isn't always a wonderful experience right now. So while there's certainly something to be said for having shiny new software -- and there are certainly plenty of things to love about Lollipop -- waiting for Google to iron out the kinks also has its advantages. The Venue 8's display is the better of the two in terms of image quality. 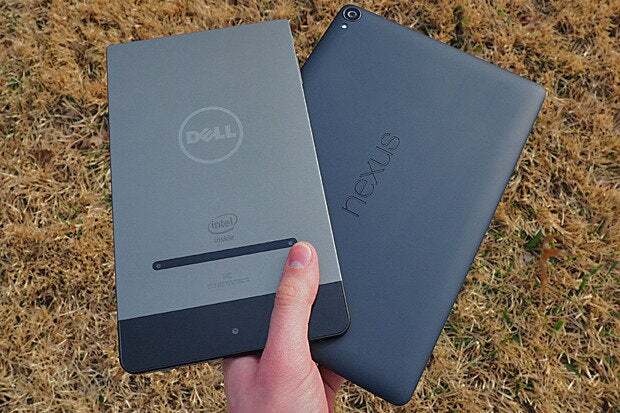 The Nexus 9's screen is fine but unremarkable while the Venue 8's is a high point of the device. The Venue 8 7000 has a 16:10 aspect ratio while the Nexus 9 has a more unusual (for an Android tablet) 4:3 aspect ratio. Some people prefer 4:3, as it gives you a wider surface area that's a bit better suited to Web browsing and document viewing, especially in the horizontal orientation. On the other hand, 16:10 is better suited to video watching, as videos take up the entire screen (in horizontal orientation) instead of sitting in the center of the display with giant black bars on either side as they do on 4:3 devices. Either way, you win some, you lose some. The Nexus 9 has dual stereo speakers on its front while the Venue 8 has two front-facing speakers that live side by side on a single end of the device. The Nexus 9's sound is surprisingly muffled, though -- and so even without a stereo arrangement, the Venue 8 sounds noticeably better. Neither tablet is perfect in terms of performance, but the Venue 8 generally feels faster and more responsive in day-to-day use. It also doesn't suffer from any of the (possibly Lollipop-related) memory management issues present on the Nexus 9. The Nexus 9 comes with 16GB of internal space -- or 32GB, if you want to pay an extra 80 bucks. The Venue 8 has 16GB of internal space with no higher option, but it also has an SD card slot that allows you to add up to 512GB of additional storage. If you want a bigger display or a softer, warmer device, the Nexus 9 is probably the more sensible choice for your needs. And if having Lollipop right now is important to you -- and/or you value knowing that you'll always have the latest Android software straight from Google as soon as it's released -- by all means go the Nexus route. Otherwise, I'd steer you toward Dell's Venue 8. It's generally the nicer tablet of the two, with a far more premium and high-end vibe that includes better build quality, a more impressive display, and more consistent performance. Throw in the exceptionally compact design, standout speakers, and option for expandable storage, and it's got the clear upper edge overall. And remember, as I've said before: This level of choice and diversity is what makes the Android ecosystem as interesting as it is. Something for everyone, right? A difficult decision is a wonderful kind of problem to have.